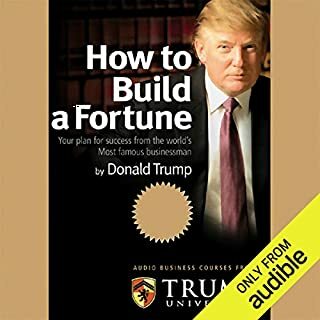 In Trump 101, Trump himself becomes your personal mentor and coach as he shares tips, tactics, and strategies, all designed to help you make the most of yourself, your career, and your life. Each chapter covers a basic rule or belief and shows you how to make it work for you. Learn the vital qualities and skills that every successful businessperson needs. 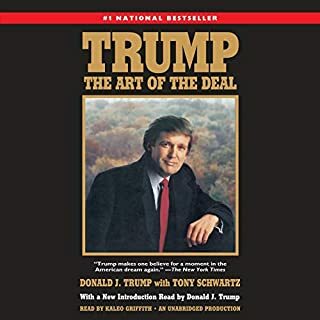 Ever since he wrote The Art of the Deal, Trump has been the world's most famous negotiator, even though he didn't reveal his actual deal-making secrets. Now, George Ross explains the tactics that too Trump to the top and how you can use those same tactics and strategies in your daily negotiations. A practical, real-world negotiation playbook, this is the ultimate guide for anyone who wants to negotiate like a proven winner. Not what I expected, but I really liked it. Throughout history, thinkers from mathematicians to theologians have pondered the mysterious relationship between numbers and the nature of reality. In this fascinating book, Mario Livio tells the tale of a number at the heart of that mystery: phi, or 1.6180339887.... This curious mathematical relationship, widely known as "The Golden Ratio", was discovered by Euclid more than 2,000 years ago. Since then it has shown a propensity to appear in the most astonishing variety of places. 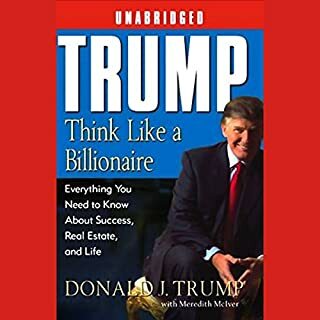 Learn the business strategies and personal secrets that have made Donald Trump one of the most successful and famous real-estate investors from George H. Ross, an exclusive insider. Ross has been Trump's executive business and legal advisor for over 25 years. Trump's smart strategies apply to ventures of any size and will have you investing with confidence. I've always been a big supporter of education. It is the foundation from which we build our lives. As a developer, I know how important the foundation is to the building. A firm foundation is absolutely necessary. It's something you cannot skimp on, or treat lightly, or rush through to get done. Sometimes people are surprised when they find out that I am so serious about being well read and how much I emphasize education. The fact that there is an educational subtext in The Apprentice is the reason I agreed to do the show. I wanted there to be some substance along with the entertainment value. People of all ages learn lessons - business and otherwise - from watching and that has been a great source of pride for me. That's one reason I write essays. They are a quick way to learn a thing or two or at least open the mind to thought. I may be successful already, but I learn something new every day. I also make the effort to learn every day. The theory behind my 'think big' credo is that if you want to build skyscrapers, or if you have big goals, you'd better have a good solid foundation to work from. These essays are one way to get that foundation in place and keep your life moving forward in the best way possible. It works for me, and I would hope it works for you. 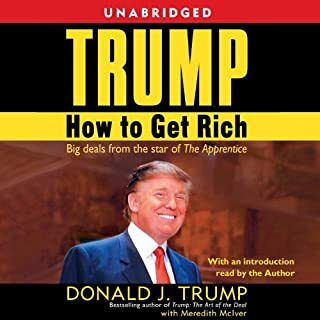 Over the years, Donald Trump has written many best-selling titles, and he has also written short pieces that summarize his singularly successful tenets on how to live the good life, both personally and professionally. 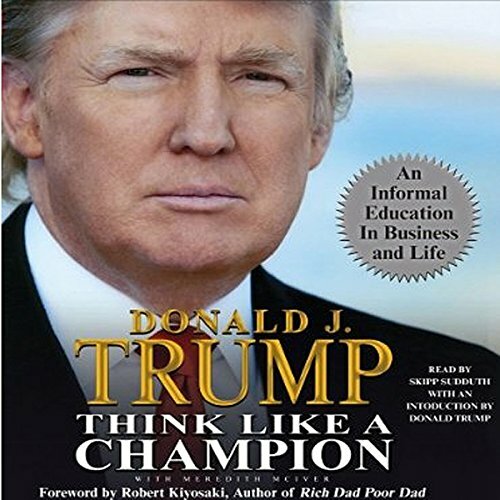 These have been personally selected by Donald Trump for Think Like a Champion, giving his special perspective in what amounts to an "informal education" on how to succeed in business and life. The pieces are engaging, informative and educational, presenting the clearest picture yet into the mind and heart of an extraordinary individual. Really good insight on how to get in the zone and stay there!😎. Build momentum and have a good tempo!! Great food for business and life! I enjoy this book and listen to it from time to time to sharpen my thinking about business principles and life habits. Donald Trump is very open about his life. Compliments to the narrator as well! As the owner of a small business, my takeaway is that Trump hits the nail on the head with his knowledge and willingness to share. He wants all to succeed. It's no wonder he defied all the odds to become our 45th president. When learning to be a success, it is critically important to learn from those that have a long track record of great success. Thankfully, there are some successful people willing to share, at least some of what they've learned with others, in order that more people might have a greater chance of success, as well. Those willing to share positive information; that has the power to change the lives of others and by extension those around them for the better really do help make the world a better place. 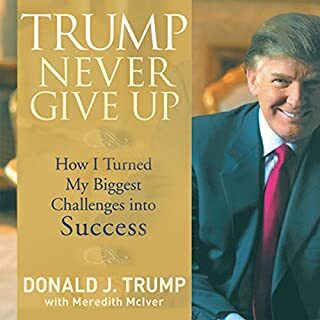 Success leaves clues, thank you Donald Trump for allowing many people to learn what you are willing to share; that has helped you become such a great example of success, particularly in family and faith and continuing business sucesses and never giving up and overcoming; even when facing odds that would have overwhelmed most others, by never giving up. It is very interesting and motivating and encouraging hear what you are willing to share; including other aspects and ways of thinking that tend toward successful outcomes in different areas of our lives. A truly inspirational book that educates and entertains in a constructive way on how to succeed in business and life!! I will surely listen to it again! he is just simply the best! I hope we get to hear more from you, Mr. Skipp Sudduth! I've read some reviews of Mr. Steve Job's audiobook version (the narrator is not getting good reviews so far).. they could have picked you as the narrator! They would have definitely loved you! 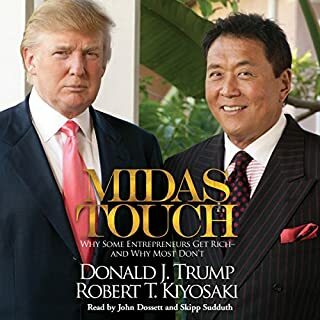 I’m skeptical that these were Donald Trump’s ideas due to his current behavior, but this is a great book that will enhance your life no matter your current age or what area of business you are interested in. Place your political beliefs to the side while you listen and truly try to implement the advice provided in this book. Couldn't stop listening. My respect for Trump is off the scale. He's brilliant and this book is so well written. Probably the best of three so far. Looking forward to the next one. I cannot recommend enough all Trump books including this one. They will teach you the determintaion and the vision required to do big things in your life and the passion you need to live by.